Best Rated Ninja Professional Blenders – This is a roundup of the best rated Ninja blenders, available in 2017-2018. Smart-Review limits the selection to only those blenders with the highest consumer reviews. Blenders can be used to chop, mix, and blend ingredients for a variety of recipes. One of the most popular uses is for beverages, especially smoothies. High end blenders have longer warranties, and are better constructed and have more power than cheaper ones. Ninja blenders offer high power at a low cost, and a 1 year warranty. Higher end blenders from Blendtec and Vitamix are the top end of blenders, solidly built with 7 year warranties, but are much more expensive. Below is a comparison chart of the top Ninja Professional blenders available, comparing their differences, price, top model features, and consumer reviews. Nutri Ninja = Ninja offers a person sized blender primarily for making smoothies and drinks. They only come with smaller jars/cups. LCD Display = This can offer information such as a countdown till the pre-programmed blending is done. Pre-Programmed Auto-iQ Blender = Ninja offers pre-programmed settings in some of its blenders which will automatically blend in the optimal speed for different types of blending. Ninja calls this Auto-iQ. Some examples are Smoothies, Frozen Desserts, Purees, and Nutri Ninja blending in the provided Ninja cups. Blender Watts = Watts are a measure of energy used, and is a good indication of the power that the blender can produce to crush ice, and make more consistent smoothies. So, higher watts are better. 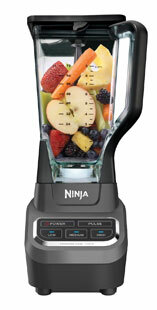 Most full size Ninja blenders are over 1,000 watts of power. Making Smoothies = For smoothies you should get a blender with at least 600 watts of power. Without enough power, a blender will struggle to chop up the contents finely enough, and have trouble pulverizing ice. You can also burn out the motor of an underpowered blender. Glass or Plastic Jar = The main jar used to blend and mix smoothies or other products, is composed either of Glass or Plastic. Glass is rare to see, and most are made with BPA free plastic. Plastic weighs less than glass and is less prone to breaking if dropped. All of Ninja blenders use BPA free plastic jars and smoothie cups. Warranty = All Ninja blenders offer a one year limited warranty.